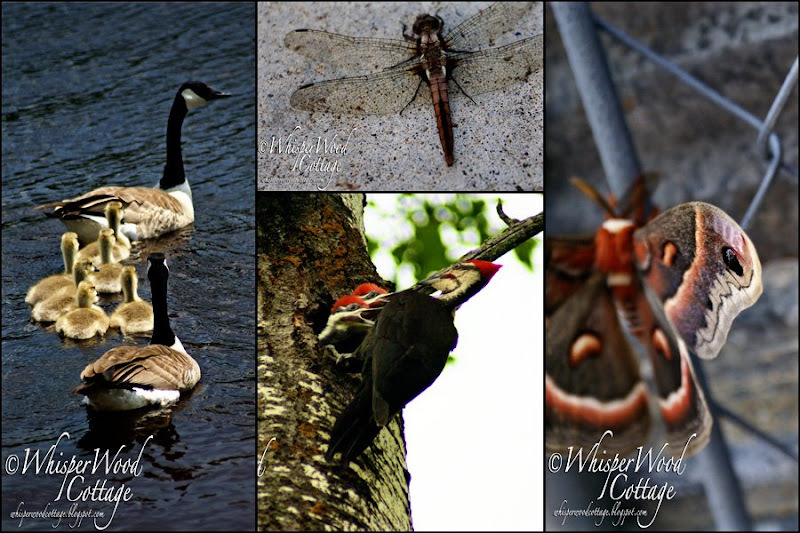 WhisperWood Cottage: Living the Wild Life at WhisperWood Cottage! Living the Wild Life at WhisperWood Cottage! I meant wildlife, not wild life! PHOTO 1: We saw these geese on the St. Louis River when we went whitewater rafting with my brother and his girlfriend a few weeks ago. PHOTO 2: This dragonfly was resting on the sidewalk. He knew how to work the camera! PHOTO 3: This is the mother pileated woodpecker and her two babies at feeding time. They live in a tree in our front yard. During mating season, daddy woodpecker likes to try to peck a hole in anything metal. The noisier the better to show off for those females! Pileated woodpeckers are the largest (about 15") woodpecker in North America. Night or day, those babies weren't shy about saying they were hungry! Go to allaboutbirds.org and hit play to hear their call! PHOTO 4: I found this moth taking a nap on the inside of the junk shed door. His colors and textures are fabulous! This is as wild as it gets here at WhisperWood Cottage! How about in your neck of the woods (or desert, or beach, or mountains, or wherever you call home)? What creatures make you pull out your camera, hush and watch, or run away screaming? You know what wild animal makes me run screaming! I love the photo of the moth. I have never seen that coloration on one before. Just gorgeous. You must have the patience of a saint to catch those photos! Nice captures!!! Big, ugly spiders get me on my feet and away! The dog barks at everything that moves around here, so I never get close enough to any wildlife to actually see it. Not to much wild life around here-although we recently found deer tracks in our backyard (fully fenced, sububaran yard-someone left the gate open). We get lots of birdies and hummers and butterflies but the most wild we see is at the hand of three rowdy kids and all their friends. And yeah, sometimes they do make run away screaming! I absolutely love those phtots! You've got an amazing eye. Say...how far are you from Bayfield, WI? We're headed there tomorrow for a little R&R. Gorgeous pics! Love the geese! I love your photos, esp. the woodpecker, they are my favorite birds. I follow your blog, and you are sure busy. Hope you are having a great summer!